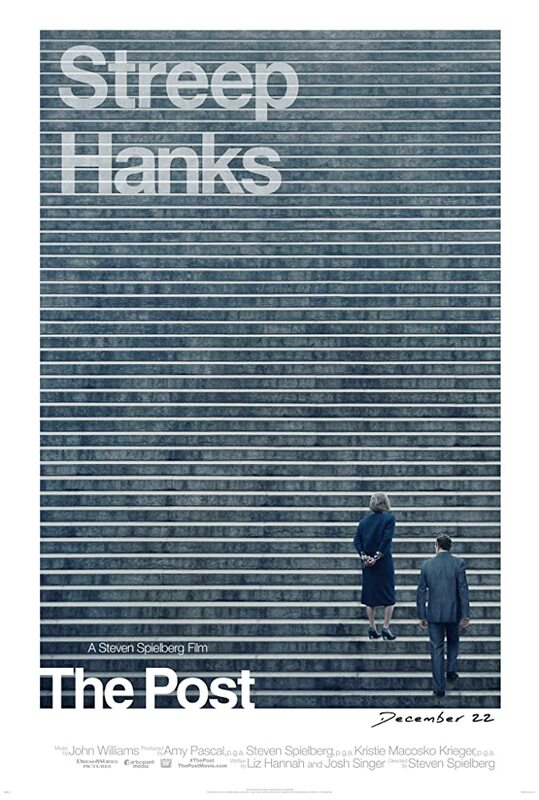 THE REVIEW: Unlike Steven Spielberg’s other recent historical film which was a disappointment to say the least, The Post hits a lot of high points. Despite some artistic license with portraying the Washington Post in this film, this is really a return to suspenseful-form for Spielberg. As director, he hits the right notes at the right times, guiding the viewer along in such a way that you’re always wondering what is going to happen next. Even for a film covering historical events — we know the papers are going to get published, we know the Supreme Court rules in favor of the newspapers — The Post makes it exciting and reveals parts of the story that, at least for me, I didn’t know. A large part of what makes The Post a compelling story and an engrossing film is the performances. Yes, yes, Meryl Streep received her 21st Academy Award nomination for playing Katherine Graham, owner and publisher of The Washington Post, but she just received a nomination because it’s merely a requirement at this point, right? An argument that while she no doubt is a phenomenal actress, at least a few of those nominations could’ve been over-hyped and not as deserved as others. Well, forget all that because she 100% deserves her nomination for this performance. Watching the film, there was a certain unspoken gravitas that Streep portrayed. Her abilities to transform minor facial expressions and utterances into scene-changing and scene-stealing moments was phenomenal. If there was ever a peak-Streep, that’s the Streep that shows up to The Post and I’ll just say it is a joy to watch. Parts of this film do fall flat or are left unexplained however. A lot of the background is left untouched or just given a token mention during a fleeting moment. The opening scene in Vietnam for example showing Daniel Ellsberg (Matthew Rhys) on the ground. I see the thought behind including that scene, but as presented it’s not a fully-formed thought. One moment you’re in the midst of gunfire and the next you’re in Washington D.C. wondering why you were just across the Pacific Ocean. Or, for another example, the history of any of the publishers/reporters. The Neil Sheehan of the New York Times is probably the most well-known and well-handled in the film (despite not appearing on screen) but that could just be from my familiarity with the aforementioned Vietnam documentary. What I’m talking about here though is why do Katherine Graham, A. M. Rosenthal (Michael Stuhlbarg) matter. We see them schmooze at parties and hear stories about how Graham is friends with Robert McNamara (Bruce Greenwood), but the film makes the implication that there’s more to this than it lets on. Why? Either make it an important part of the film or just leave their backstories out of it — focus on the story of the Pentagon Papers. The Oscar prospects for The Post don’t look promising (Streep for Best Actress, and the film for Best Picture), but that can probably be chalked up to the fact that there are even better competitors than this. Frances McDormand delivers an even better performance in Three Billboards outside Ebbing, Missouri and while I would rank The Post high on my own Best Picture ballot, the rest of the pundits don’t seem to agree.